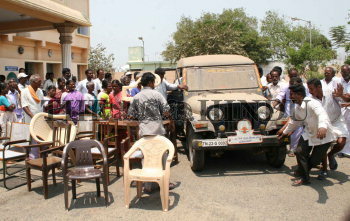 Caption : KANCHEEPURAM: Government officials and residents of five villages of Tiruvallur district who did not receive compensation for land they had given in 1990 for the Telugu Ganga Project, confiscating property of the Tahsildar Office in Poonamallee on March 26, 2007. The confiscation of property was made following an order from the Poonamallee Fast Track Court. Photo: A. Muralitharan.